Omaha is located in the center of the United States. Huddled around the Missouri River, the town is the largest settlement in Nebraska, USA. Many people define Omaha as the city of adventure. Reasons for this are interesting attractions, with which the city impresses guests. One of the features of Omaha is the ever-changing cultural landscape of the city. 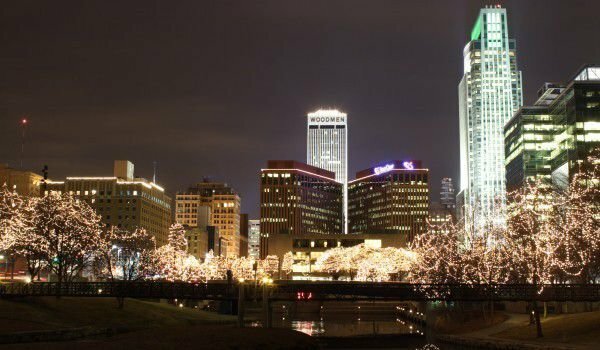 Omaha the city of entertainment, it is the birthplace of some of the richest people in the world - Warren Buffett and the legend Marlon Brando. Top attraction not only in Omaha but throughout Nebraska is Omaha's Henry Doorly Zoo. It is the largest indoor desert and largest "covered" rainforest in the world. Other attractions are the world-class Aquarium, the Scott Hubbard forest populated by orang-utans, gorillas Valley, IMAX screenings, Bear Canyon, Pavilion of insects and many more. The complex is open every day from 10 am to 5 pm. Tickets for access cost between 9 and 13.50 dollars. Other popular green areas of Omaha are the Omaha Botanical Gardens, as well as Kenefick Park and the Dreamland Historical Project. Another popular place in Omaha is the Omaha Children's Museum, in which kids can have fun with interactive activities, meanwhile learning a lot about the world around them. In Omaha is the largest skyscraper in Nebraska - the 193-foot building of the First National Bank Tower. In the center, there are many other attractive tall buildings, giving a dynamic view of Omaha. In Omaha is conducted one of the biggest sporting events - the annual College World Series of baseball. One of the architectural landmarks of Omaha is Joslyn Castle, in the Gold Coast Historic District. Omaha locals jealously guard their cultural traditions. It is no accident that there is the largest community theatre in the United States (the Omaha Community Playhouse). Besides it, the city has several theatres with a rich history. The Joslyn Art Museum is also a centre of attraction for many visitors to the city because there is stored and constantly enriched a rich exhibition of unique works. Another busy place is the scary Durham Museum. The ideal place to create and implement exciting Afro-American music is called the Omaha Black Music Hall of Fame. Do everything possible to make a short or long visit there, so you can enjoy some of the memorable performances of the performers. An amazing place for shopping, dining and entertainment is called the Star Market. In the area there are many restaurants, shopping malls, bars, jazz clubs and art galleries. The atmosphere is enhanced by street musicians and artists who entertain guests and locals. Among the most popular dishes are the Omaha steaks. The old market was entered in the national register of historic places in contemporary USA. The geographic location of Omaha earned it the nickname of the West Gate. The largest city in Nebraska was founded in 1854. Since Omaha is a very convenient location - the town quickly became an important transportation center in the U.S. The name means city of the slope.